Stage Directions are given by the Director during the normal course of the rehearsal process. During the period of time when the Director is "Blocking" the show. 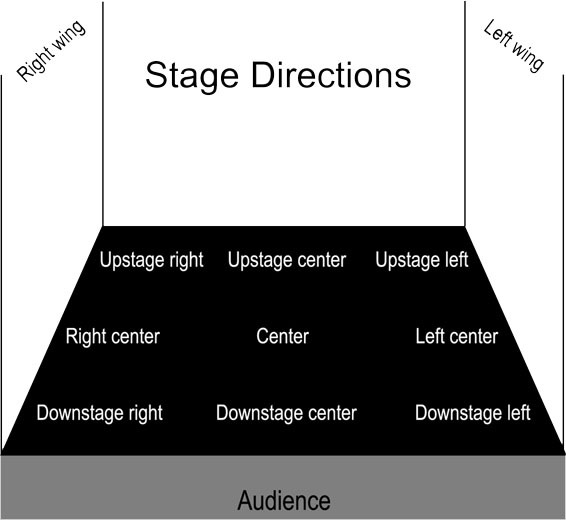 "Blocking" a scene is accomplished when the actors are given directions that help the scene to progress, and by facilitating the movement of the play. As a result the movement of the actors help to convey what effect the Director is going for in that scene. The diagram below will give you a reference to understand the Director's instructions. On stage your viewpoint is reversed from that of the audience, and you must learn to take this viewpoint. As an actor your viewpoint is facing the audience. This is the most important thing that you can remember when taking and following stage direction.